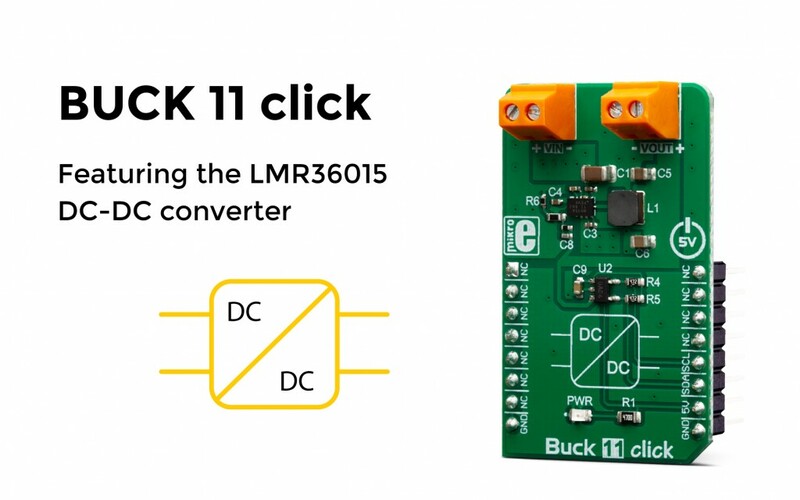 The Buck 11 click is a high-efficiency, step-down converter which provides 3.3V on its output, derived from the connected power supply voltage, in the range from 4.2V to 60V. This Click board™ is based on the LMR36015, a highly efficient DC-DC step-down converter. In addition, the Buck 11 click offers to monitor the stability of the output voltage by employing an additional A/D converter circuit. Due to its high efficiency, the LMR36015 allows the Click board™ to easily deliver up to 1.5A of current. The efficiency for lighter loads is optimized by using the PFM mode. It features a HotRod™ package which enables a low noise performance, high efficiency, and very compact size. The LMR36015 has a wide voltage input range, which is one of its key features. It also features a set of standard protection options: undervoltage lockout, short circuit protection, thermal shutdown, etc. For more information about the Buck 11 click, please visit our website.